They're really easy and fun to make! I followed the tutorial over at Cornflower Blue Studio. 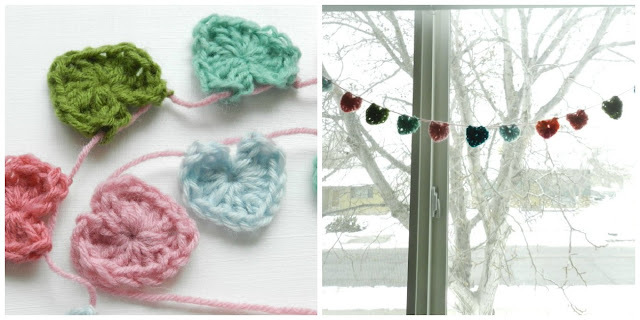 Then I had to turn all my colorful little hearts into a garland, of course. They make me happy! Super cute! I really like the color combination. Maybe someday you can teach me to crochet. oh my gosh I love these!!! I'm going to pin them. I just learned to crochet... I'm going to have to snoop around to get some other patterns from your blog ;) THanks for sharing! What a fun little bunting! Buntings are so fun, aren't they? I need to make one to hang above the windows in my girls' room! I hope you'll link up at Off the Hook! These are so sweet! I've got to give them a try. Thanks for the great idea and link for the tutorial. Have a wonderful day! I am just learning how to do crotchet..I will have to give these a try! These hearts are so pretty. My grand-daughter inlaw is making them in pinks and reds for a bridal shower that we're throwing. They will each be attached to a pin for the ladies to wear. New follower here, BTW. Found your link on the Tuesday hop. Stop by my site, too! They turned out beautifully! I love the idea of making them into a garland. Pinning it! Super cute! Popped in through Sugar Bee Crafts linky party. Thanks for linking to Take-A-Look Tuesday over at Sugar Bee Crafts - you were featured today!